Why Lean - What's in it for Me? To more quickly serve Arizona citizens, the Arizona Department of Economic Security Unemployment Insurance Call Center applied lean tools to create more efficiency and accountability. 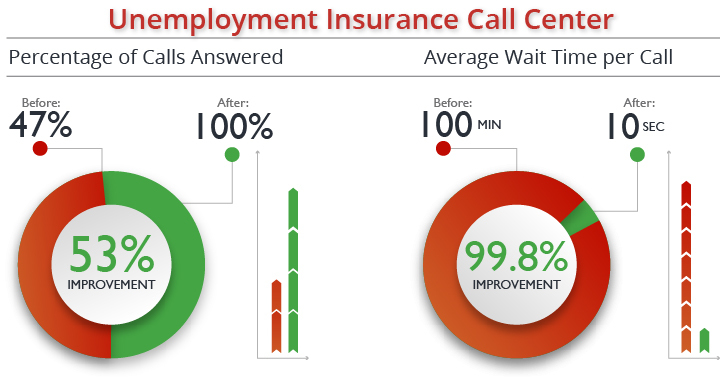 The team discovered the call center was only answering 47% of incoming calls and the average time spent on hold was approximately 100 minutes. As a result of their efforts, the call center was able to answer 100% of calls and reduce the average hold time to less than 10 seconds.